There are two kinds of people in the world, those who get Bat Out Of Hell as the joke that it is and those who don't. Those who don't usually sport mullets and wife-beaters under studded leather jackets, or are under 15, or never paid any attention to the album. Everyone else does. This is the most ridiculous piece of rock ever committed to vinyl, and is self-conscious enough to do it right. It is just carefully treading that thin line that makes sure some people will take it seriously, which other bands like The Darkness for example fail to do. Come on Meat Loaf, just his name is funny, he was famous by 77 due to his part in the Rocky Horror Picture Show in 75 and much like that this is also supposed to be the music for a musical. Actually this would work pretty niftily as a musical, it is epic enough, with big shades of Springsteen, it is particularly easy to connect the title song with Thunder Road for example. Only while Springsteen is writing about working class escapism, Loaf is writing about pre-pubescent obsession. So it is funny, but it is in the end a novelty album and like most novelty albums it stops being as funny with repeated listenings, the music isn't good enough to sustain it, the joke stops being as funny by the third time you listen to it, but it is still a great piece of entertainment. P.S.- I got autographs by Peter Hook and Stephen Morris of Joy Division today... I was smoking a cigarette outside the Cornerhouse and they were coming in for the Press viewing of Control. Gladly I had a notebook with me. Its musical style is influenced by Steinman's appreciation of Richard Wagner, Phil Spector and Bruce Springsteen. Although not an immediate hit, the album has become one of the biggest selling of all time. It sells about 200,000 copies per year and has sold an estimated 34 million copies worldwide. Rolling Stone magazine ranked it at number 343 on their list of the 500 greatest albums of all time. Steinman produced a sequel in 1993 called Bat out of Hell II: Back into Hell, which includes the hit single "I'd Do Anything for Love (but I Won't Do That)". 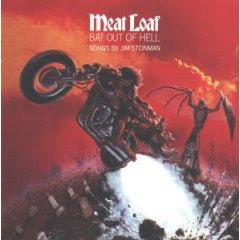 A second sequel, Bat out of Hell III: The Monster Is Loose, released in October 2006, featured seven songs written by Steinman. Well done on the autographs, by the way. Weren't those guys in New Order at some stage? Yeah, New Order was Joy Division after Ian Curtis dies so they were the Bassist and Drummer for New Order respectively. I only lack Bernard Sumner to have the whole of New Order and all the living members of Joy Division. Have to agree with timbo on this one. I've always hated it from day one. While I have nothing against Mr. Loaf in general, this album was far too bombastic, obvious, and simple-minded for me to appreciate it as parody, satire, or anything in the humor vein. Actually I've always considered the fact that it such was a giant hit a prime example of American bad taste. And I say that as an American. I totally agree, but how does that not make it funny?